Today these terms are virtually interchangeable as Web design companies alternate the way they describe their services. The two terms Website design & Website Development is two fundamentally different aspects of the website building process requiring 2 skill sets. This is why it is important that you know the difference as you look for someone to design or develop your company’s website? Let us see if we can provide some clarity between website design & Website Development. 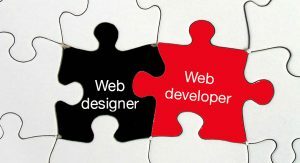 Website Design / Website Development Differences. Website design refers to both the a set of principles underlying the work of a particular artist or artistic movement portion of the website and it’s usefulness. Website designers use various design programs such as Joomla, WordPress, Drupal and other Content Management Systems (CMS) to create the layout and other visual elements of the website. Website developers (programmers), takes the designed website and build a fully functioning website with more functions like database development . In other words think of the design as a non-interactive state of a website. Developers take that design and break it up into it’s components and structure. Website Developers then either use HTML or programming languages such as PHP to develop the functional website pages. Advanced website developers may choose to utilize a Content Management System (CMS) like WordPress or Joomla in order to streamline development and allow clients an easy way to maintain and update their website. Website developers may convert a normal layout into a interactive website by using image and content. People who are not familiar with the industry think that both are same but in actual these both terms are totally different depending on the skill sets and roles played by both the positions. Learning the differences is so important! Great info!